A 12(twelve) day long Summer Football Camp-2018 was organised by Department of Physical Education, Rajiv Gandhi University ( RGU ) Doimukh, under the department’s Extension Activities termed as “Project Masoom”. The camp was held for the age group of 5 to 14 years from 11th to 22nd June, 2018. A total of 50 children participated in the camp which was divided into 3 groups. 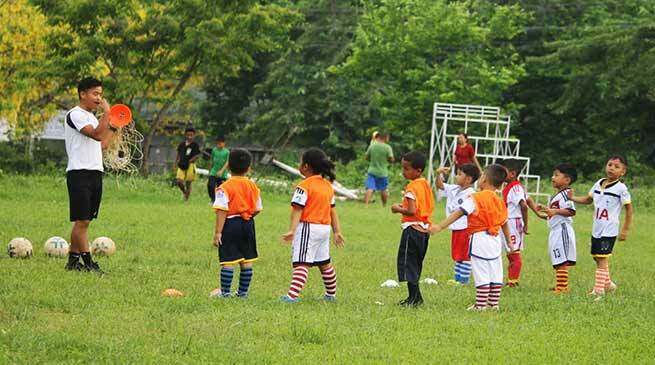 The activities in the camp included teaching basic skills of football and recreational activities. The camp was an effort of the department to engage the children in productive activities leading to wholesome development of personality. Apart from learning basic skills, knowledge on proper hygiene, discipline and moral education were also imparted during the camp. The former students of the department Peto Taring, Midak Basar, Kaha Camdir Pai, Hemant Gamre and Rikpu Kamcham who are pursuing their Masters Degree in various reputed institutions outside the state acted as the coaches and instructors during the programme. The programme was conducted under the supervision of Dr. Anil Mili, Head in-charge of Physical Education department. Attending the certificate distribution ceremony, the Joint Registrar of RGU Dr. David Pertin, advised the trainees to study hard, obedient to parents and to live a disciplined life to excel in all aspects. Among others Associate Professor of Geography Dr. Tage Rupa Sora, Assisstant Professor of Physical Education Dr. Shambu Prasad, Assistant Town Planner, Urban Development Terge Sora, Medical Officer from Doimukh Health Centre Dr. Tana Sharmila, parents and students witnessed the programme.